Tellurium is usually found stuck to various metals in the ground. It forms ores with gold, silver, copper, and lead. When refining these metals, some unfortunate people have come into contact with purified tellurium—and exposure means you reek of garlic for weeks. Tellurium was a favorite among early alchemists, because it was often found hidden in other metals. They thought it was a stepping stone on the way to gold, but not a very pleasant stepping stone. The fact that they gave it the name, “metallum problematum,” pretty much sums up their attitude towards it. It probably made them unpopular in their communities. One half of a microgram of tellurium absorbed into the body gives a person extreme garlic breath for 30 hours. 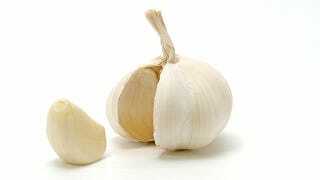 More will cause a miasma of garlic to permeate from someone’s mouth and pores for weeks. One of the warning signs of tellurium exposure, for people who work in factories that use or create tellurium, is extreme garlic breath. How on Earth does a metallic element, just an element, make you reek of garlic? For the most part, it’s the body’s doing. What you’re smelling, when you smell “garlic” after tellurium exposure, is (CH3)2Te, or dimethyl telluride. The body metabolizes tellurium the same way it does sulfur, one of the elements that makes garlic stinky. (That’s also the way that the body metabolizes selenium, which is apparently preferentially absorbed by garlic plants.) Sulfur and selenium are cousins of tellurium—they’re both members of a group called chalcogens—and sulfur and selenium are directly above it on the periodic table. Essentially, your body recognizes these elements as having similar properties, even if you don’t. And it responds by stinking.